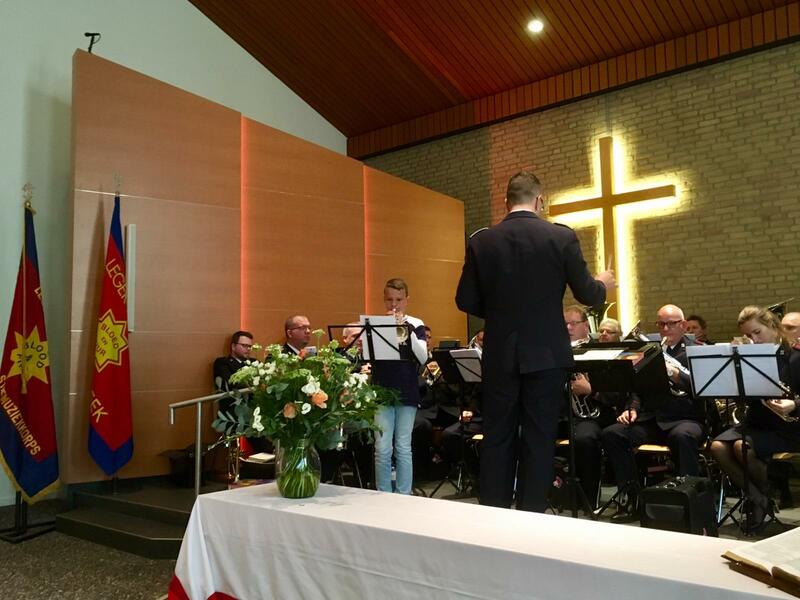 The Amsterdam Staff Band (Bandmaster Olaf Ritman) had high expectations for their first ministry weekend after the summer break. In addition to the usual concerts and worship opportunities, the band was privileged to provide music for the wedding of one of its members. The weekend started with the marriage of the Staff Band’s principal (and only) second cornet, Hanneke Vredenburg, who married Stefan Nieuwland (grandson of former Staff Bandmaster Brigadier Cor Nieuwland). The bride is also a member of the Valleistreek Corps in the city of Ede, and chose the beautiful Big Church in the city center for the wedding. The Staff Band was happy to provide the music for the occasion and its solo contribution – again, the bride’s choice – was Living Power (Tom Davoren). The band then settled outside of the church for an outdoor concert. The church is located in the middle of a large shopping center. Many people stopped to listen, several hundred people enjoyed the Staff Band’s offerings on a lovely sunny afternoon. In the evening, the Staff Band returned to the church for a concert, which was shared with a very enthusiastic choir. The band started off with a piece new to their repertoire, Part 1 of Music from the Elizabethan Court (Elgar Howarth). This was immediately followed by Salvation Is Created (Olaf Ritman), one of the items that the band played extensively during their tour of the United States in April 2018. The band’s first soloist of the evening was principal baritone Jorijn van Hese who effortlessly played the beautiful solo Psalm 121 – My Help Comes from the Lord (Olaf Ritman). Better World, a waltz sequence based on the tune “Zealley” which is associated with the words, “There is a better world, they say”. Heavenly Home, an elegiac cortege using the tunes “My home is in Heaven”, “I have a home that is fairer than day”, and “The home over there”. The second half of the concert started much like the first, this time with Part 4 of Music from the Elizabethan Court. Both parts have a strong “middle ages” feeling and are a good change from the style of music usually played by the Staff Band. 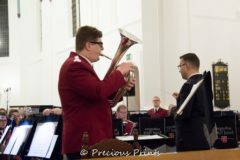 This was followed by the second soloist of the night, Michel Rosenquist, who played the euphonium solo No Longer I (Sam Creamer), a lively solo with lots of notes. The the entire cornet section was featured in The Spirit In Me (Kevin Larsson). A highlight of the concert was the world premiere of a new work by Bandmaster Ritman, Evening Variations, based on the hymn tune “Evening” by Bramwell Coles. As usual, the concert ended with Triumphant Prospect, taken at a blindingly fast tempo, with some of the players reporting that “smoke was coming from their valves”. The large, enthusiastic, and appreciative crowd thanked the band with a standing ovation. Sunday morning was spent at the Valleistreek Corps, which is the home corps of the Staff Bandmaster. The meeting was led by the band’s Executive Officer, Lieutenant Hans van den Hoek, who spoke about trust. Only recently, this corps lost one if its bandsmen who passed away after an illness. This man was of great character and loved by all, and the event inspired Bandmaster Ritman to compose a new piece in his memory. Unbounded Love was the result, and it is anticipated that this piece will be used throughout the world. After the morning meeting, there was a short “wind-up” as it was called in former days. The Staff Band played The Break of Day (Steven Ponsford) and the cornet solo Floods of Joy (Olaf Ritman). Then one of the young people from the corps, coincidentally Bandmaster Ritman’s son, Julian Ritman, came forward to play a solo with the Staff Band. Boundless Futurists is often used to give a youngster an opportunity to play a solo with the Staff Band. The wind-up ended with Strong to Deliver, a modern version of Herbert Booth’s song “Jesus Is Strong to Deliver”. 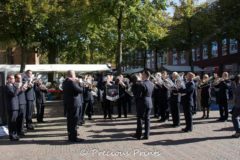 Sunday afternoon was spent in Veenendaal, a city next to Ede, where the Staff Band had a “swing-in” with gospel singers Gerald and Nelinda Troost. Over 700 people enjoyed this happening where the band provided several accompaniments as well as solo items, which were Living Power and Ad Optimum (Peter Graham). 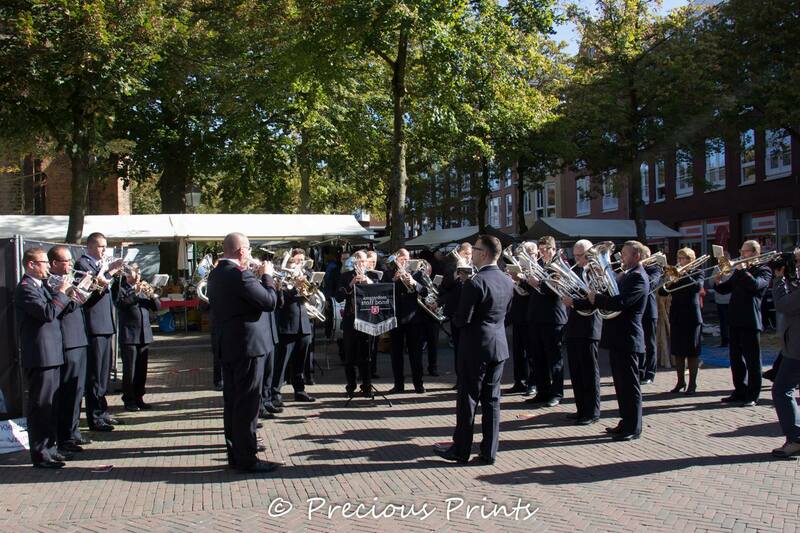 This article was posted in News and tagged Amsterdam Staff Band, concert, Cor Nieuwland, Ede, Gerald Troost, Hanneke Nieuwland, Hans van den Hoek, Jorijn van Hese, Julian Ritman, Michel Rosenquist, ministry weekend, Nelinda Troost, Olaf Ritman, outdoor concert, Stefan Nieuwland, wedding, worship service on 3 October 2018 .